Jeff Perry, owner of Cincinnati Fitness & Boxing and Coach of the Cincinnati High School Boxing Team and the University of Cincinnati Boxing Club. 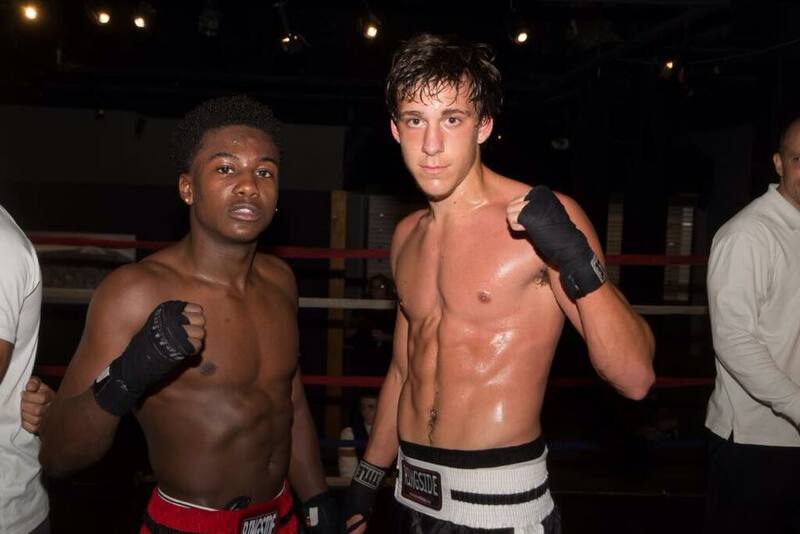 As we get ready to start another year for the Cincinnati High School Boxing Team & the University of Cincinnati Boxing Club, a quick look back at last season. 2017-2018 was by far our best and most active season for the UC Boxing Club. Due in large part to the hard work by Club President Tyler Rutz, we had a record number of members this past season with everybody putting in a lot of hard work and having a lot of fun. In intercollegiate boxing competitions, 8 different UC boxers competed in 10 total events, with an overall record of 16-10. Fighting both locally in Cincinnati, Columbus and Oxford, we also traveled to compete at the New York City Athletic Club in November, at the Washington Athletic Club in Seattle in January and at the University of California Berkeley in February. In addition to UC boxers competing at those 3 out of state shows, we also took several members of the Miami University Boxing Club to each of those events as well. In March 2018, UC had 3 boxers compete in the NCBA Midwest Regional Tournament hosted by Xavier University. Freshmen Jacob Maslyk & Joe Carli both advanced to the Finals of the Regional Tournament in the 132lb and 139lb weight classes respectively, qualifying them for the NCBA National Tournament. They both lost their matches in the Regional Finals to their friends and training partners from Miami University, Ryan Adelson & Adan Salguero. It was a great experience having all 4 of those guys training together and making the finals of the tournament together and exhibiting tremendous sportsmanship when having to fight each other. Also congratulations to UC boxer Sarah Stoner who won her match in March at the Cincinnati Regional Golden Gloves Tournament. In April we traveled to the West Point Military Academy in New York to compete in the NCBA National Tournament. It was a fantastic experience for Jacob and Joe to fight in Nationals as freshmen. Jacob lost a very close split decision in the quarterfinals to a senior from the University of Washington. Joe won his quarterfinal match to earn NCBA All-American Honors before losing in the semi-finals to a boxer from Army. And big congratulations to Miami’s Adan Salguero for winning the 139lb NCBA National Championship (and being named Outstanding Boxer of the entire tournament) and Ryan Adelson for being the 132lb NCBA National Runner-up. The Cincinnati High School Boxing Team had a slightly smaller team than usual, but still had a good season with many of them, along with many UC boxers, competing in our Intramural Boxing Show in February. Due to the Aquinas Institute also having a smaller than usual team, we unfortunately had to cancel our annual event with them due to a shortage of evenly matched bouts. However, we hope to resume that competition this season. The High School Team was led by Oak Hills student Nathan Todd. First off, Nathan had a strong academic year, winning a USA Boxing National Academic Award for his achievements in both the classroom and in boxing. Nathan also was able to skip his senior year of high school so he will be attending the University of Cincinnati this year and boxing for the UC Boxing Club. In May, Coach Jeff Perry took Nathan Todd, former High School Boxing Team member Sean Scott and Miami University’s Adan Salguero to Ireland for a week of training and sight-seeing in Balleymoney, Northern Ireland and Belfast. This was our first trip as part of the cross-cultural non-profit organization Bridges Beyond Boxing. We had an amazing time and were treated with incredible hospitality by Irish Coach Spike Martin and all of the people we met in Ireland. We hope to be able to give more kids the opportunity to make this trip again next year or sometime soon. The boxing team from Ireland, including 12 boxers and several coaches, will be coming to Cincinnati the week of September 10. They’ll spend some time training with us at Cincinnati Fitness & Boxing and will have a competition on Sep 12 against boxers from Cincinnati, including Nathan Todd. After not competing for nearly two years due to numerous hand injuries, but continuing to train hard that entire time, Nathan Todd finally resumed competing in July. In his first match back he won in Covington, KY and followed that up by winning the 141lb Novice Youth Division at the Ohio State Fair in Columbus, OH with a 3rd round TKO. We are very excited for Nathan to be fighting again and now starting his collegiate boxing career at UC. We’re already off to a fast start this season with UC Sophomores Jacob Maslyk & Joe Carli and UC Freshman Nathan Todd, as well as several others, training hard to be ready for the opening of the NCBA boxing season in October with an eye towards competing as often as we can and increasing the amount of travel we did last season. Led by those 3 underclassmen, several additional returning UC boxers and whatever newcomers we get to join this season, we’re expecting to continue building the UC Boxing Team into a force to be reckoned with in college boxing. With official practices starting in October, for info on the start of the new season check out the High School Boxing Team and UC Boxing Club pages on this site, as well as the Team Information page. This entry was posted in Uncategorized on August 24, 2018 by CincinnatiAmateurBoxingClub. Apologies for lack of posts about the 2016-2017 season. We were too busy coaching, training and competing to keep the website updated. It was another terrific season with a really great competition against the Aquinas Institute in February. Many team members have been training all summer long, gearing up for the start of the new season. For the High School Boxing Team, there will be an Information Session / Open House on Tuesday, October 3 at 6:30pm at Cincinnati Fitness & Boxing (2929 Spring Grove Ave.) Practices will start on Monday, October 9. For the UC Boxing Club, conditioning at Nippert Stadium will start in September and practices at Cincinnati Fitness & Boxing will start in October. There will also be an Information Meeting held on campus in late August. Specific dates will be announced soon. Join the Facebook Group Page “UC Boxing Club” to stay up-to-date on dates, times and information. This entry was posted in Uncategorized on August 19, 2017 by CincinnatiAmateurBoxingClub. A lot has happened since last season ended. The 2014-2015 season closed with a great event in February against the Aquinas Institute at the Cincinnati Athletic Club. Congratulations to both teams and all the boxers who competed at that show. Congratulations to John French from Walnut Hills and Tim McMahon from Aquinas for being named the Outstanding Boxers at that show. Also congratulations to Dougie Wunder from Oak Hills and Alex Bohme from Aquinas for putting on the Fight of the Night! Things have remained busy during the spring and summer. 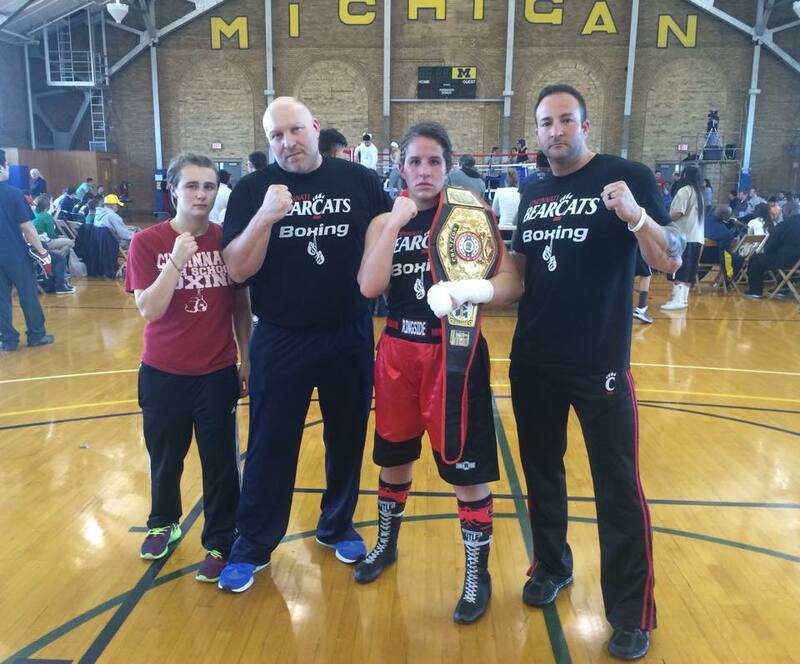 In April, UC Boxing Club President Katie Harrington won the United States Intercollegiate Boxing Association (USIBA) Middleweight Championship at their national tournament at the University of Michigan in Ann Arbor! In the finals Katie won a unanimous decision over a tough opponent from West Point Military Academy to claim the championship. Katie followed up that win by also winning the Middleweight Championship at the Ohio State Fair in August! 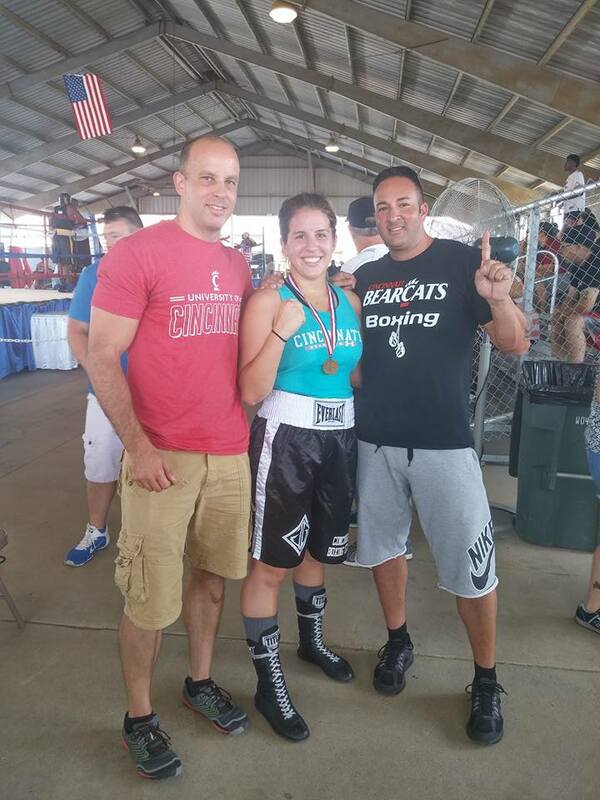 It was a great summer for Katie and she’s training hard for another great season with the UC Boxing Club. 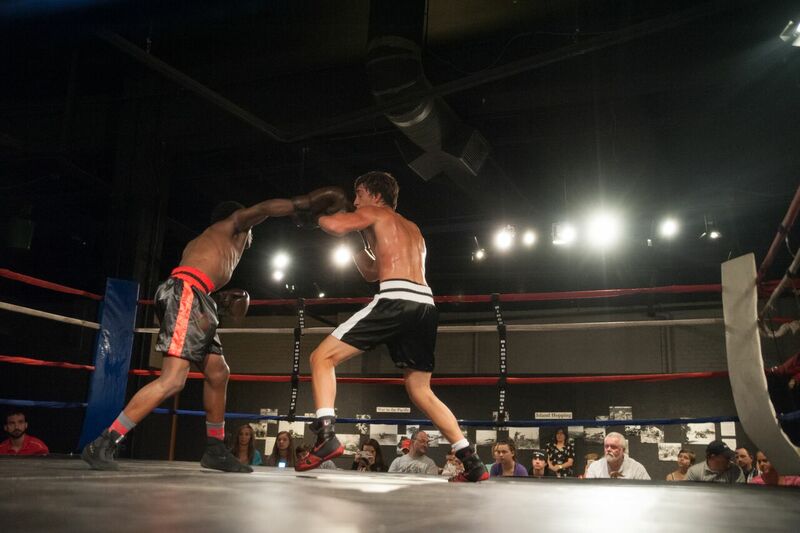 Later in August, Cincinnati Fitness & Boxing was invited to take part in an event at the Cincinnati Museum Center. They hosted their 1940’s Weekend celebrating the decade of the 1940’s. CFB moved a boxing ring into the Museum Center and recreated the atmosphere of a live boxing match from that time period. 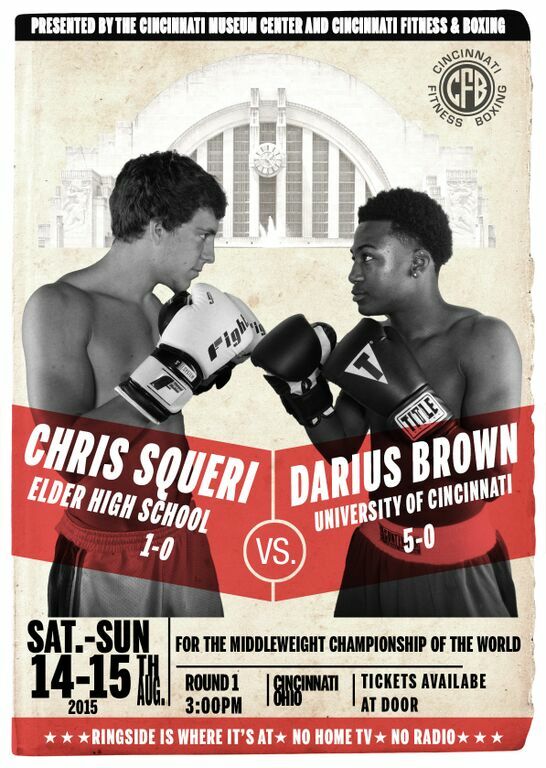 Darius Brown (former CHB boxer and current UC Boxing Club member) and Chris Squeri (CHB boxer and Elder High School Senior) competed in two exhibition boxing matches for Museum Center visitors. They boxed a total of 12 rounds over two days in what the Museum Center staff said was the highlight of the entire weekend event. Finally, there have been at lot of improvements over the summer to Cincinnati Fitness & Boxing, the home gym for both the CHB & UC teams. In April, Kenny Christo and Ben Schneider became co-owners of the gym along with the gym founder Jeff Perry. Since then, many improvements have been made to the gym space and equipment as we prepare for another great season ahead! Practices for the 2015-2016 Season will start on Monday, October 5. They will run on Mondays and Wednesdays from 4:00-5:30pm during October and then expand to 3-4 days per week starting in November. For returning team members who want to start earlier, there are opportunities to train at the gym right away, just contact Coach Jeff or Coach Kenny. Spread the word to any friends who may be interested in joining the team that practices will start on Oct 5. More information will be given out at the first practice. For any questions, you can email Coach Jeff at cincinnatifitnessboxing@outlook.com. This entry was posted in Uncategorized on September 7, 2015 by CincinnatiAmateurBoxingClub. The matches are still subject to change, but as of now here is the bout sheet for this Saturday’s CHB vs. Aquinas boxing show. 10:00am at the Cincinnati Athletic Club downtown. $10 adults and $5 students at the door to watch 18 boxing matches. This entry was posted in Uncategorized on February 12, 2015 by CincinnatiAmateurBoxingClub.